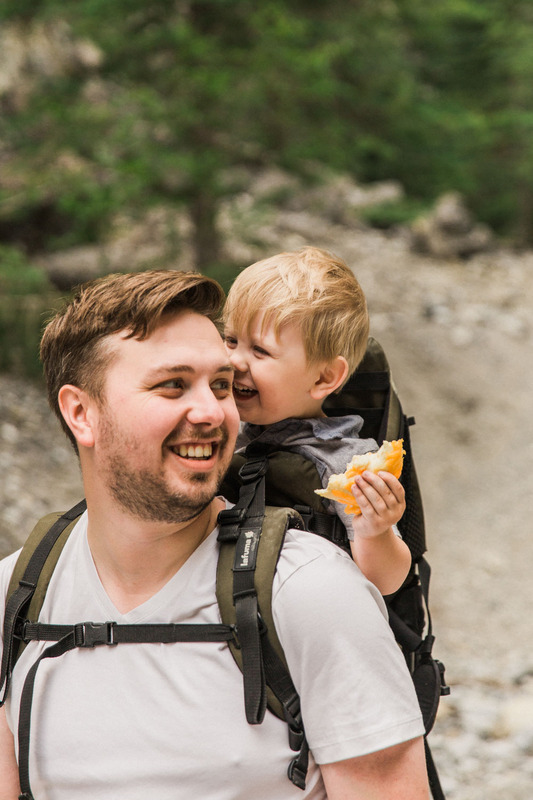 We are always on the lookout for easy hikes that we can do with our family, and that aren't too far from Calgary, and Grotto Creek Canyon is one of those. I'd hiked it previously when Georgia was just a tiny baby, hauling her along in a pack, and we had done it once in the winter, carrying both kids (it's beautiful in the winter with the frozen waterfalls at the end, but wear crampons! It's slick). 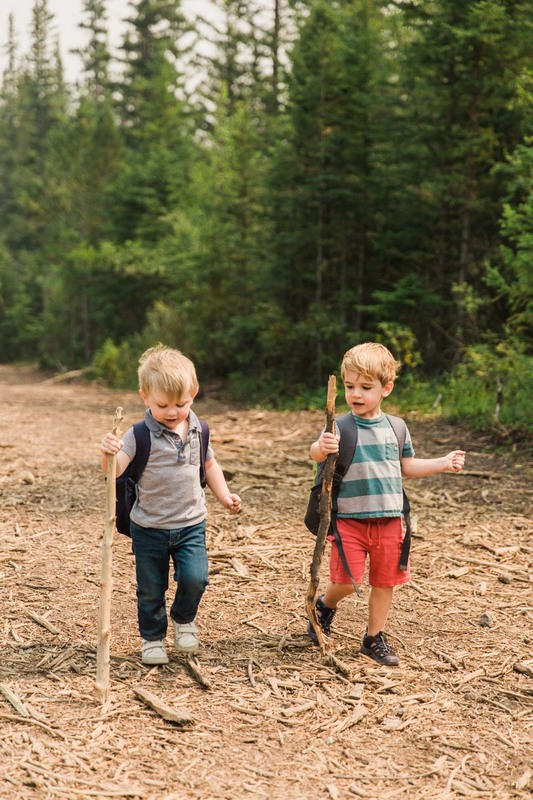 Now that my kids are big enough to handle most of the walking on their own, I thought it would be great to try again, and why not invite my sister-in-law's family as well? Cousins make everything more fun. To find the trailhead, google map your way to Grotto Mountain Pond. When you see the Grotto Pond sign, you can pull in there to park, use the outhouse, and picnic at the tables. The hike starts from there, but we like to continue just a little farther Southwest down the road until we get to the next turn-off, where there's the Baymag processing plant. If there's room, we park there, because it's just a little bit further into the hike, and every step counts with kids as small as ours! The Grotto trail actually crosses that little parking area, so why not? Follow the trail up and past the plant, through the forest, and don't worry about the noise, it will fade once you get to the canyon. We came across a small fork in the path, and followed the right path further into the forest and up. About 1 kilometre from the main parking area you will find yourself at a beautiful viewpoint. 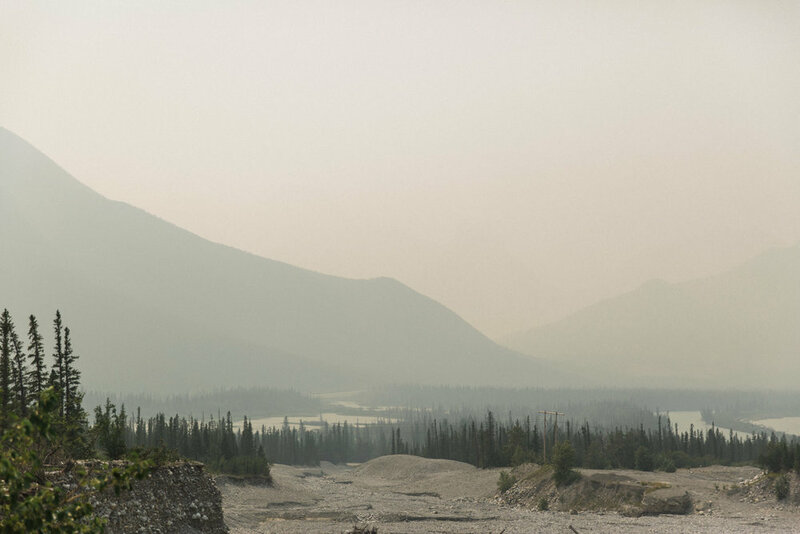 It was smoky on the day we went, but still pretty. This is where you climb down into the riverbed and make your way into the canyon. Climbing over the first boulder is pretty slippery, but on the way back the kids had a blast using it as a slide. It's pretty interactive this way, keeping the kids quite entertained. Whenever they would slow down we would get them excited about the waterfall at the end, telling them to just keep going until they find it! 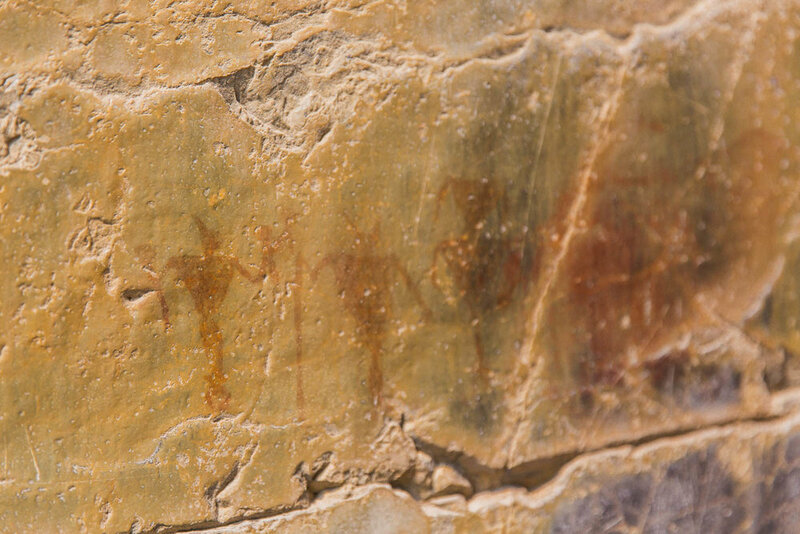 One the last corner, before you make the final turn to the waterfall, you'll be able to see ochre pictographs. From the reading I've done, they are said to be between 500-1200 years old. As with anytime you go hiking, always be respectful of where you are and try and leave it as you found it. Don't touch the pictographs, as it will cause them to deteriorate much faster. 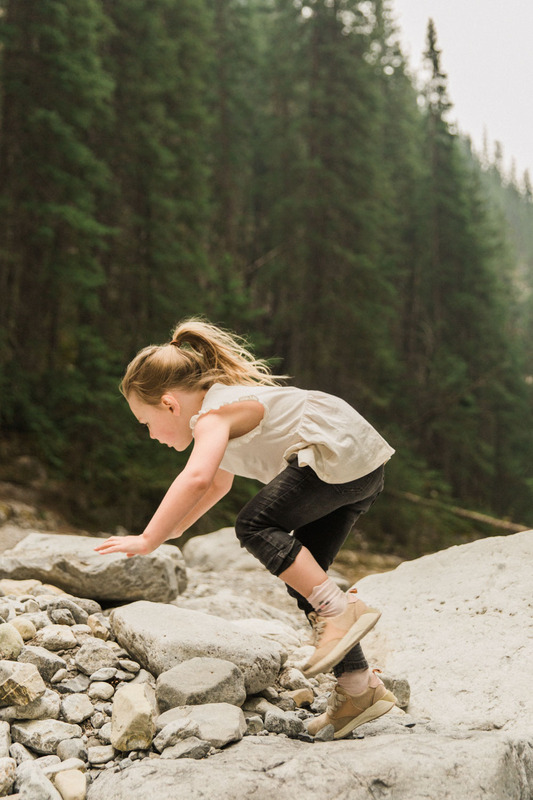 It's a great chance to teach your kids about respectfully enjoying the outdoors and preserving our past in an unselfish way for others to experience it as well. When you turn that last corner, you'll see this "Weeping Wall," which creates some cool ice formations in the winter. In the corner to the right of this is the waterfall. The rocks up there are pretty slippery and I wasn't planning on climbing right up to the top of the waterfall, but the kids were already halfway up by the time I came to that conclusion, so we had to follow them right up. The kids loved it, they dipped their feet in the little pool at the top, but getting everyone back down safely without slipping was certainly interesting. Not sure I'd recommend climbing right up in there! Down on the canyon floor is a great place to stop for lunch and hang out, enjoying the beauty, taking a rest, and listening to the gurgle of the waterfall. In the summers you can often find people climbing the sides of the canyon, and in the winter there are often ice-climbers on the frozen waterfalls, it's pretty neat to watch. After lunch we packed it up and turned back down the canyon. It was a great time spent with family, the kids had fun and felt accomplished, and watching them become more and more adventurous as they explored and climbed was so awesome to see. Not to mention that I'm a happy mom because I got to enjoy the mountain air and get a hike in, all while spending time with my favourite people. In total, this hike is 4.4 kilometres return from the main parking lot, it's pretty easy with a total elevation gain of 115 metres. Without small kids, it would take between 1.5-2 hours. For us it was closer to 3.5 hrs., including our lunch break. Definitely doable. We ended our evening at the Grizzly Paw restaurant in Canmore, they have fun flavours of soda that they make locally in their brewery (if you get a soda, you can choose a different flavour for each refill!) and the atmosphere is fun and loud, making it the perfect place to take 5 kids for dinner. 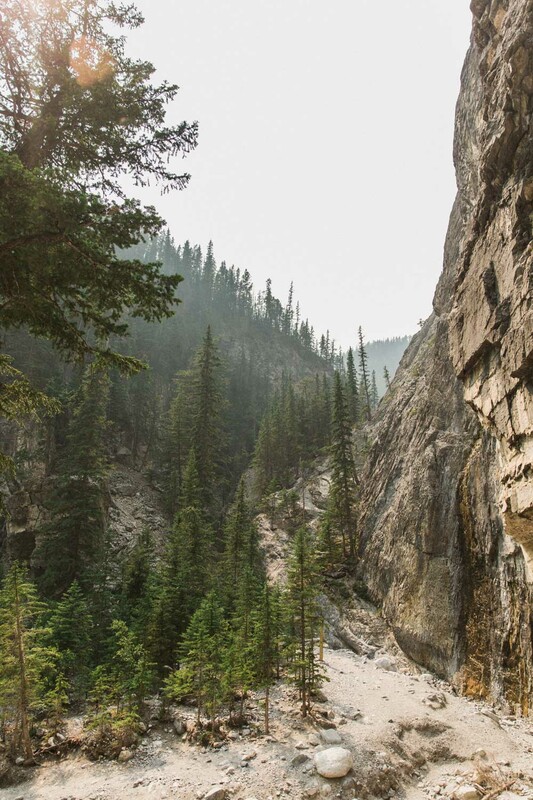 If you try hiking Grotto Creek Canyon, let me know how it goes! And have fun making memories.